We’d love your help. Let us know what’s wrong with this preview of Carry the World by Susan Fanetti. 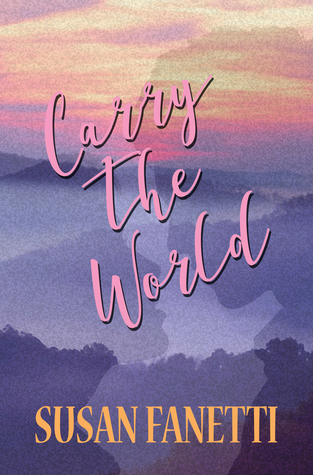 To ask other readers questions about Carry the World, please sign up. I was born and raised in the Midwest. A few years ago, I was transplanted into the dusty soil of Northern California and have apparently taken root there. An inveterate geek and gamer, I am a fan of many things considered pop culture and maybe even lowbrow. As a reader, my favorite genres are science fiction and fantasy, but as a writer, I've found my home in romance--or perhaps it's better to say I was born and raised in the Midwest. A few years ago, I was transplanted into the dusty soil of Northern California and have apparently taken root there. An inveterate geek and gamer, I am a fan of many things considered pop culture and maybe even lowbrow. As a reader, my favorite genres are science fiction and fantasy, but as a writer, I've found my home in romance--or perhaps it's better to say simply "love stories." I have a yen to try other genres, too, at some point, but for now my muse wants to tell stories about lovers and families. I write for the joy of it, and I write stories that I want to read. If others like them, too, that's just the cherry on top. I’m not interested in rules and formulae. I follow my muse and my characters and let them take me where they want to go, wherever that might be. I like big emotions, dark and light. I like complicated characters with flaws and weaknesses as well as strengths, and I like each character’s strengths and weaknesses to be different from those of other characters. I’m much more concerned that my characters be interesting and diverse than that they be widely considered to be likable. I try to create people, not types. Likewise, I want my stories each to be distinct from the others. Once I’ve told a story, I don’t want to tell it again. So even within a series, one of my books might be very different from the next. Some might be very dark, others equally mild. That isn’t to say there aren’t trends and recurrences in my work. I’m drawn to certain themes and settings, and my muse has her favorite toys and tools. But I guard against those tendencies becoming a formula. Of my current work, The Signal Bend Series (MC romance) is complete, with seven books and a novella released: Move the Sun, Behold the Stars, Into the Storm, Alone on Earth, In Dark Woods (the novella), All the Sky, Show the Fire, and Leave a Trail. The Night Horde SoCal series, a series spinning off from the Signal Bend Series, is now complete, with eight volumes: Strength & Courage, Shadow & Soul, Today & Tomorrow (a Side Trip), Fire & Dark, Dream & Dare (another Side Trip), Knife & Flesh, Rest & Trust, and Calm & Storm. Nolan: Return to Signal Bend is a semi-standalone novel that follows the Signal Bend and Night Horde SoCal series and completes the Night Horde MC stories. I say "semi-standalone" because it isn't part of any series,but its backstory is included in both Night Horde series. The Pagano Family series (family saga) is complete, with six volumes: Footsteps, Touch, Rooted, Deep, Prayer, and Miracle. A Viking historical romance series, The Northwomen Sagas, is now complete as well, with four volumes now available: God's Eye, Heart's Ease, Soul's Fire, and Father's Sun. The Brazen Bulls MC series is also in progress, with six volumes now available: Crash, Twist, Slam, Blaze, Honor, and Fight. Somewhere, Book One of The Sawtooth Mountains Stories, a new series of contemporary western romance, is also available. And a standalone historical romance set in the Edwardian Era, Nothing on Earth & Nothing in Heaven, is also available. The Freak Circle Press is an independent collective of friends and fellow writers.